Our Big Fat Budapest Nightlife Guide: What to Do, Where to Drink, and Best Area to Stay in Budapest for Nightlife. 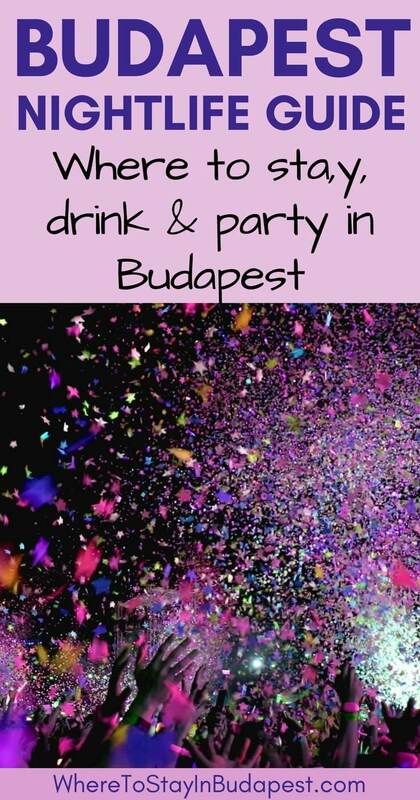 This is a Comprehensive Guide to Budapest Hungary Nightlife to Help you Plan your Trip! Budapest is spectacular during the day. Full of culture, history, architecture, and shopping, there’s enough to keep anyone busy for days on end. But when the sun sets, Budapest really comes into its own. 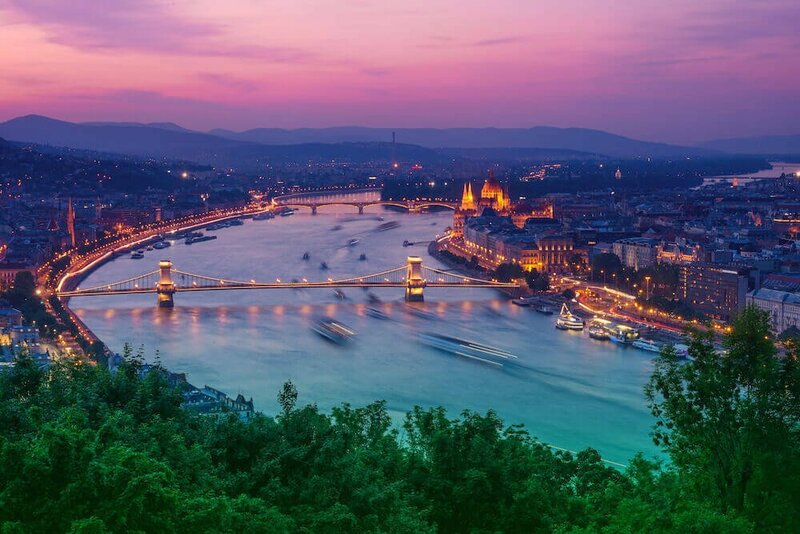 As the sun sets over the Danube, Budapest’s ruin pubs and wine bars begin to buzz. Locals and tourists flock to the famed 7th district for a hit of the city’s lively nightlife. Dinner cruises fill up the Danube. Cultural performances entertain those looking for a high-brow evening. And the city’s nightclubs, cocktail bars, and pubs burst to life. Whatever your idea of a great night out is, Budapest’s nightlife scene has something for everyone. Want to dance until dawn? Hit up Budapest’s 7th District. More interested in tasting Hungary’s many high-quality wines? Budapest has plenty of wine bars to choose from. If you’re in town to pull off a stag party for your best mate, you certainly won’t be alone. And if or a low-key or cultural night out sounds more your speed, you’ll find plenty to occupy. As locals in the city, we’ve had the chance to explore Budapest’s nightlife in depth. We put together this guide to help anyone who is visiting the city and wondering what to do in Budapest at night. We hope our experiences help you plan the perfect trip to Budapest! Where Can you Find Budapest’s Best Nightlife? If you’re wondering which area to stay in Budapest, this section should give you all the answers you need, and help you choose which district to stay in Budapest to suit your trip. The 1st (Castle District) is the best area in Budapest for those looking for a quiet, romantic experience. If your main focus is going out in Budapest, you’ll likely find the Castle District too quiet and isolated. The 5th District in the city center (Pest) is the best Budapest area for general sightseeing and luxury hotels. 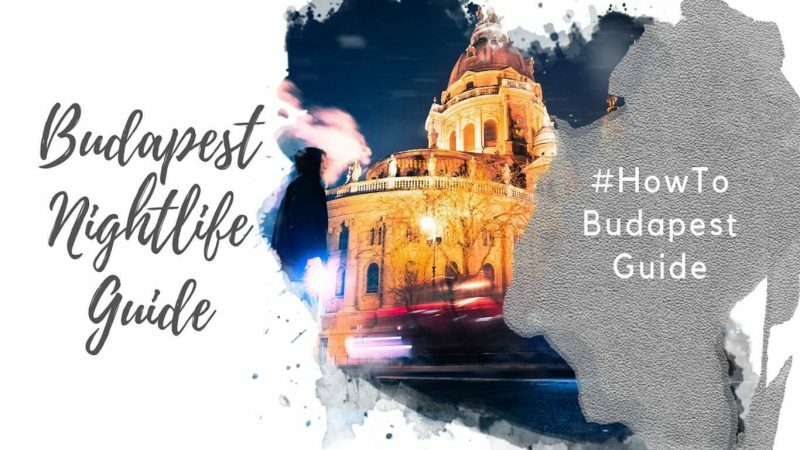 If you want to stay in a 4-star or 5-star property or want the best hotel location in Budapest from an overall tourism perspective, the 5th is the best district to stay in Budapest. It’s also a quick walk from most places in the 5th to find the best night life in Budapest, including anything from high-end wine bars to clubs, ruin pubs, and cheap student hang-outs. Focus your Budapest hotel search on the 6th and 7th districts if you want the best area to stay in Budapest for nightlife. The 7th is considered the Budapest nightlife district, although there are plenty of places to go out in the 6th as well. For more details about where to go out in Budapest, keep reading! If you’re looking for cheap places to stay in Budapest, consider staying in the inner 8th district. 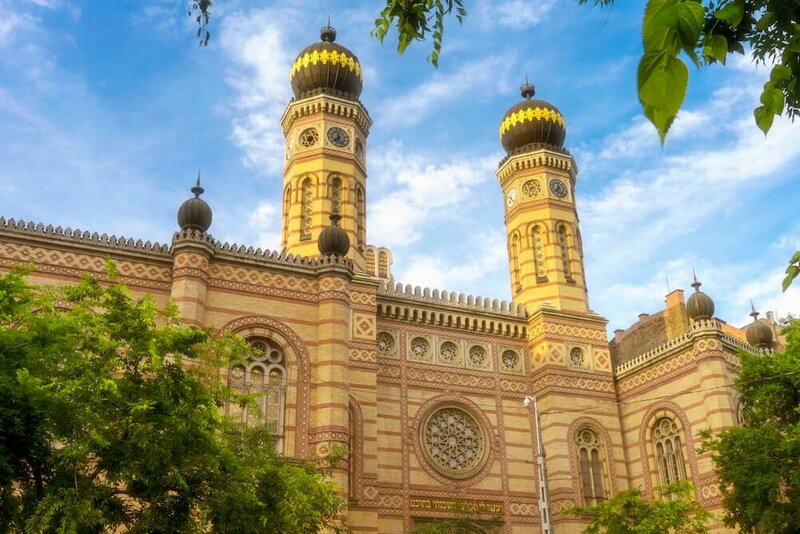 For those on a budget, the 8th might be considered the best location to stay in Budapest due to the fact that it’s slightly beyond the highly desirable 1st, 5th, 6th, and 7th districts, while still being very convenient. If you like to stay a bit off the tourist trail, the 9th and 13th are the best neighborhoods in Budapest to get a feel for local living. Both districts are quite large, and you’ll want to stay in the inner sections, closest to the Pest city center. In the 9th, look at hotels near Eleszto (as a point of reference). For the 13th, look for hotels or holiday apartments near Szent Istvan krt. Budapest’s 5th District is considered one of the best areas to stay in Budapest for tourists, although it’s not in the heart of the nightlife district. The 5th District is home to the Hungarian Parliament building, pictured. 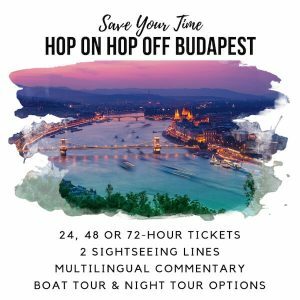 What’s the Best Area to Stay in Budapest for Nightlife? If you’re wondering what area to stay in Budapest to enjoy the city’s nightlife, we recommend the 7th and 6th districts. Without a doubt, the best place to stay in Budapest for nightlife is the 7th district. The 7th is the best district in Budapest for nightlife and has the most bars and nightclubs. The inner part of the district between Karoly krt (Charles Boulevard) and Erzsebet krt. (Elizabeth Boulevard) running east-west, and between Kiraly u. and Rakoczi ut running north-south is considered the Budapest bar area. If you’re wondering where to stay in Budapest for nightlife, but don’t want to stay right in the heart of it, you should also consider the inner 6th district. The 6th district has a small pedestrianized bar and restaurant street on Hajos ut. While not exactly the zenith of the Budapest party scene, it’s a lively area and nice place to stay, while still giving you easy access to the 7th (for the true bar district Budapest) and the 5th, for sightseeing and higher-end restaurants. If you choose to stay in the 6th, Oktogon is a good landmark when looking for hotels. If you find yourself within a short walk of Oktogon, you’ll be in a convenient location for exploring the entire city, and for nightlife. 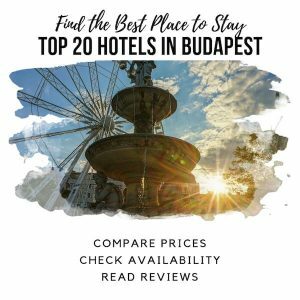 What are the Best Hotels to Stay in Budapest Within the Budapest Nightlife Area? Where is the best place to stay in Budapest for those coming to the city for nightlife? We’ve outlined a range of hotels throughout the 6th and 7th districts below, which are both considered the best location in Budapest for nightlife! See our picks below for the best places to stay in Budapest Hungary for nightlife. We suggest making your Budapest booking using Booking.com, if you’re planning to stay in a hotel, and Hostelworld if you’re planning to stay in a hostel. In our experience, they tend to have the best inventory. Corinthia Hotel (rated 9.2/10), the Ritz-Carlton Budapest (9.0/10), Kempinski Hotel Corvinus (9.1/10), and The Aria (9.6/10) are all excellent 5-star luxury hotel choices, all within an easy walk to Budapest’s most popular nightlife areas. The Aria has the distinction of being voted the best hotel in the world! Eurostars Danube Budapest (rated 9.1/10), Carat Boutique Hotel (8.7/10), and Ambra Hotel (8.6/10) are all well-rated 4-star hotels located right in the heart of Budapest’s nightlife district. Hotel Moments (9.6/10), Callas House (9.4/10), and K+K Hotel Opera (8.8/10) are a short walk away from the nightlife area, but will be a bit quieter! Roombach Budapest Center (rated 9.0/10), Mika Superior (8.8/10), and Ibis Budapest City (8.6/10) are good options. 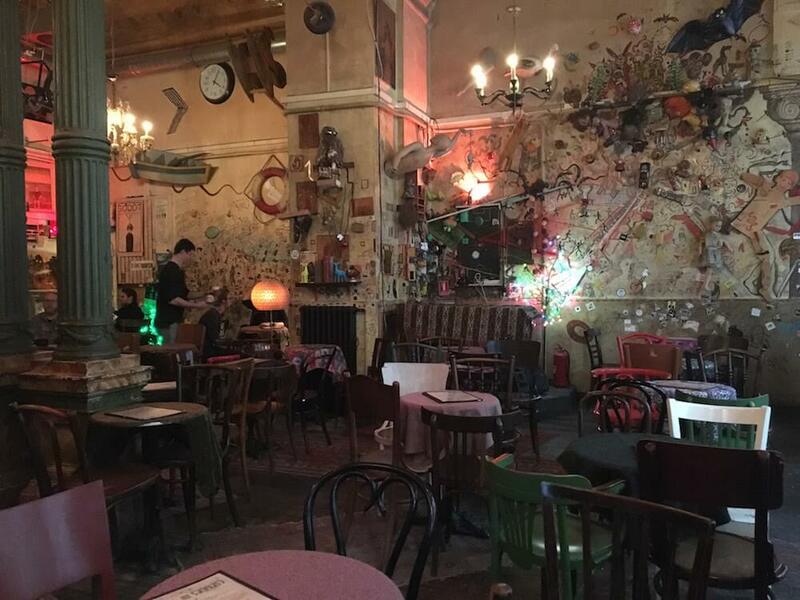 The top-rated 3-star within an?easy walk of the Budapest nightlife area is Casati Budapest Superior (9.4/10), which is one block from Kiraly St, a popular nightlife street filled with bars and restaurants. 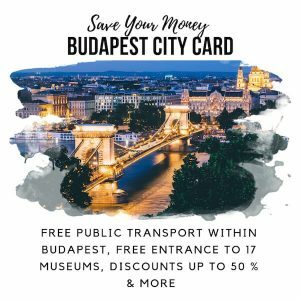 Where Can I Find Some Cheap Accommodation Budapest That’s Still Central and Convenient? Your best bet for budget Budapest accommodation is a hostel, and the best hostels in Budapest are located in Pest, close to the nightlife. We’ve outlined a few options for great hostels below, which should get you started in your search for great Budapest places to stay, even if you’re on a budget! If you’re looking for places to stay in Budapest for cheap, Hostelworld is a great go-to source for hostels throughout the city, offering what can only be described as a massive selection of the best hostels in Budapest to choose from. The hostels we’ve listed below are all rated 8.5/10 or higher by past guests, and most are rate 9.0/10 or higher. AVAIL Hostel (rated 9.9/10), Downtown Oasis (9.8/10), Big Fish Hostel (9.6/10), 7 x 24 Central Hostel (9.4/10), and Activity Hostel (9.3/10) are all well-reviewed choices right in the heart of the nightlife district, or on the border and within a quick walk to bars, clubs and restaurants. Hostel One Budapest (rated 9.8/10) and Hostel One Basilica (9.6/10), Carpe Noctem Vitae (9.4/10), Retox Party Hostel (9.2/10), and The Hive (8.5/10) are all good choices if you want somewhere to start the party before going out, or finish the party at the end of the night. The 7th District is considered the Budapest Nightlife District when evening falls. It is also the heart of the city’s Jewish community, and is full of cultural treasures to explore during the day. If you’re wondering where to party in Budapest, we’ve outlined a few of the most popular options below. The 7th district (Erzsebetvaros) is considered one of the best places to party in Budapest. More specifically, what most people would define as the ‘party area Budapest’ falls within the inner part of the 7th district, contained between Karoly krt and Erzsebet krt., and between Kiraly ut. and Rakoczi u. While the entire area is filled with bars, restaurants, and clubs, there are a few clusters and famous parts of the district that draw the most people! For a fairly low-key Budapest night out, Kazinczy utca is a great bet. This is mainly because of Szimpla, the most famous ruin bar in the city, which calls Kazinczy Street home. With Szimpla at its epicentre, Kazinczy has grown into one of several popular restaurant and bar streets in Budapest, giving you plenty of selection in terms of spots to choose from. 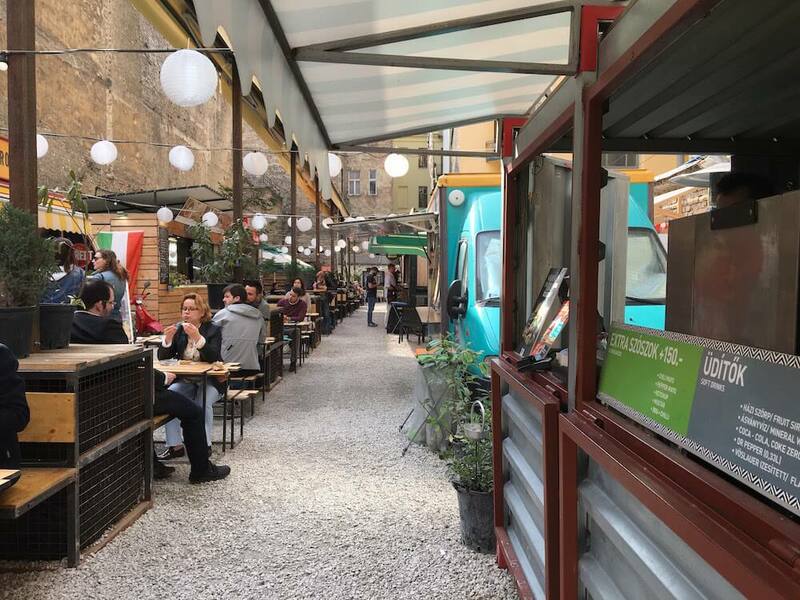 In the summer, there is a street food pod just down the street from Szimpla called Street Food Karavan, where you can grab a beer or fröccs (wine spritzer, a very popular Budapest drink, especially in warm weather) and some street food, and enjoy a low-key meal with friends. Running through the center of the 7th district, both Kiraly and Dob streets are popular among those looking for more of a party street Budapest, as they’re lined with bars and restaurants, giving you loads to choose from. Toward the western end of the streets, you’ll find Gozsdu udvar (Gozsdu Court) running between Kiraly and Dob. Gozsdu is one of the top Budapest party places, with loads of bars and restaurants to choose from, and an appeal for all ages. It’s essentially a wide, covered alley running from Kiraly and Dob into a central courtyard area. From there, another small alley runs up to Hollo u. and down to Rumbach u., and both of these areas are also lined with bars and restaurants. 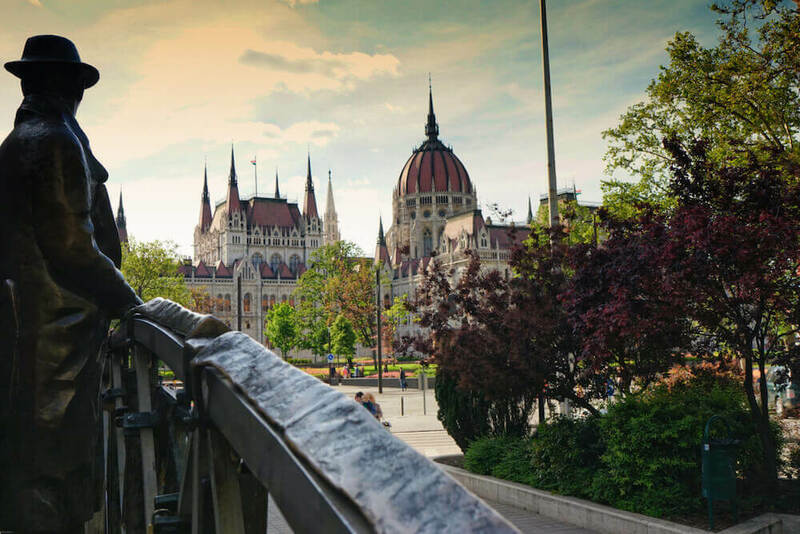 If you’re planning a Budapest Stag Do, read on for our tips about where to stay in Budapest Hungary for a stag, what to do, and other tips! If you’re planning a stag party Budapest, staying in the 7th district would be your best bet, or in the 6th close to Oktogon and Kiraly u. Pubs, clubs, ruin bars, etc, are all fairly concentrated in this area. You can read our instructions for getting from the Budapest airport to the city centre, but if you want to all stay together (i.e. not take separate cabs), take a look at this option: this company offers 20 seater vans, and 50 seat coaches are also available. There are no shortage of taxis at the airport, which usually end up being about €25 to €30 per cab to the centre. In terms of what to do, consider a spa party (sparty), escape room, and beer bike during your visit – these are some of the most popular stag do activities in Budapest. 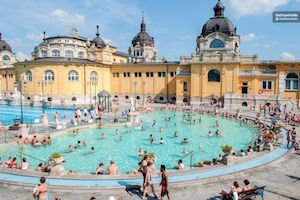 Szechenyi thermal baths hosts the most famous spa party, and you can book tickets online here (book in advance, as they sell out quickly). 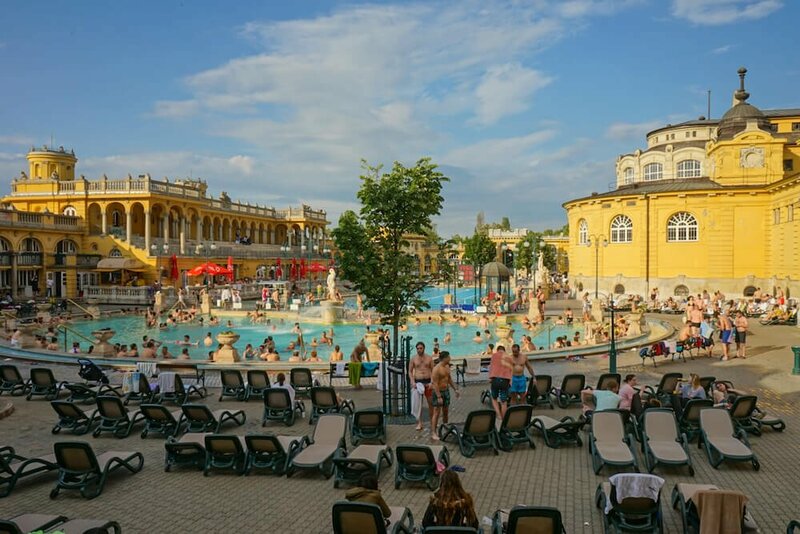 Even if you don’t go for the party, it’s worth going to the baths to enjoy and relax during your stag do trip, and you can buy full-day passes in advance to skip the queues. It’s one of the most popular attractions here, so they are quite accessible by. Funnily enough, the metro line (Line 1) is the oldest underground metro in mainland Europe, and is UNESCO protected. We also recommend doing an escape room, which are really popular here and there are hundreds of scenarios to choose from. Teams are limited to 5 or 6, so you’ll need to book multiple scenarios at the same time. Check out Mystique Rooms, Gozsdu Mission, or E-Exit Rooms to get started in your research. Beer bikes are also very popular here for stag dos, although we haven’t tried one ourselves. There are a number of companies out there, so do your research in advance to figure out the best option for your trip, including how many of you there are on the stag do. Finally, definitely go to a ruin bar. Szimpla Kert is the most famous one, but there are many to choose from. Whereas Szimpla Kert has more of a pub or bar vibe, Instant is the most famous ruin club in Budapest. If you’re here in the warmer months (usually April 1 to mid-October), there will be patios and outdoor beer gardens all over the city, which is a nice way to beat the heat. Just a quick heads up – stag-do parties are very common here, but don’t have the best reputation. They have been known to cause a lot of problems, and even damage in some cases, so a group of 20 or so may not be received warmly by locals, especially outside of the 7th district. Some bars and clubs will not allow large groups on a stag do, whereas others are happy to have your business, so you do need to do some research in advance for restaurants, pubs, and hotels, etc. We recommend calling the venues you plan to visit in advance. If you’re calling from abroad, Skype makes it super cheap. Staff at bars and restaurants within the tourist centre will all speak English, so you shouldn’t have any problems with language if you call. The Budapest ruin club experience is unique to Hungary’s capital. In fact, you’re unlikely to find anything like these ruin bars in Budapest elsewhere in the world. Read on to find out what makes these places so special, and our picks for the best ruin pubs Budapest! Budapest’s ruin pubs and ruin clubs are a unique experience worth trying during your trip to Hungary. Ruin pubs are essentially pop-up bars (or clubs) that never “popped down.” When communism fell and the economy was transitioning to capitalism, there was plenty of cheap real estate in Budapest’s city center. Young, creative entrepreneurs saw the opportunity to repurpose abandoned buildings and pounced. They leased buildings from the city and filled them with a mishmash of furniture and decorations. Because of their hasty start, the bars have the appearance of a thrift shop or flea market. It’s a shabby chic look that’s more shabby than chic, but still a lot of fun. Ruin pubs have since grown into a city-wide phenomenon popular with locals and tourists. Some ruin pubs skew more towards the pub end of the scale and are great for meeting up with friends for a chat and a few beers. Others are definitely ruin clubs, and are best for a late night Budapest party experience like no other. Szimpla is the most famous bar in Budapest. If friends tell you to visit simple bar Budapest, they’re actually talking about Szimpla Budapest! Offering weekend brunch and a Sunday morning farmer’s market, Szimpla offers a low-key experience during the day. For a jam-packed bar experience, visit after dark. Szimpla is more like a pub than a nightclub. If you’re looking for somewhere to dance the night away, Instant (below) is a better bet. Eleszto is one of our favorite ruin pubs, although it’s a bit off the tourist track. The pub has different stations around a central courtyard. At each station, you can buy local craft beer, wine, or tapas. Craft beer is exploding in Budapest, and Eleszto is one of the original spots focused on local brews. That said, it’s certainly not the only game in town. For those who want to be within stumbling distance of great local beer, Eleszto also has a hostel on site! Seating is quite limited in the winter. In nice weather the inner, open-air courtyard is the place to be! Instant isn’t so much a ruin bar as a ruin club. If you’re looking for a ruin experience that doubles as a dance club, Instant is the place. In 2017, they closed their original location, and moved to Akacfa utca 51. It’s a huge complex that includes Fogas Haz, Liebling (a low-key bar with a nice rooftop in summer), and Lärm (a techno club). Csendes Vintage Bar & Cafe is another favorite Budapest ruin bars. It’s mostly locals hanging out here, and it has a pub atmosphere perfect for a long chat with a friend. The wine they serve in fröccs (wine spritzers) is of a reasonably high quality, making it a good spot to try this favorite Budapest drink. The main location is indoors, but they have a nearby wine bar garden area in the summer as well. After Szimpla, Ankert is the next most popular Budapest ruin pub. In the summer, it’s a big beer garden in the courtyard. In winter, there are some inside spaces and tables. Ankert’s vibe depends on when you go. Earlier in the evening, it’s got more of a pub/beer garden ambience. Later in the evening it feels more like a bar with music (but not a club). 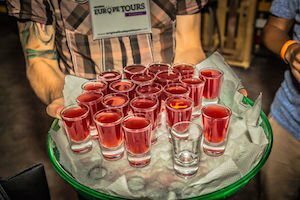 Whether you looking for some cheap cocktails Budapest or the best pubs in Budapest, we’ve picked some of the best Budapest bars to whet your whistle while in Hungary’s capital. Depending on what you’re looking for, we have highlighted our picks for the best bars in Budapest Hungary. Each section below includes a selection of our picks for the best Budapest bars and pubs. Cozy and always busy, it’s best to make a reservation here. If you plan to go on a Thursday to Sunday evening, this place fills up especially fast. Serving a small menu of both Hungarian and pub food, and a wide range of drinks, Kiado Kocsma is perfect for a casual dinner or long visit with friends. With a prime location Liszt Ferenc ter, Beckett’s is the best Irish pub in Budapest. A good spot for pub grub and a pint, when the weather is nice the outdoor tables offer great seating along the pedestrianized square. Just around the corner from Kiado Kocsma, The Caledonia is a Scottish pub filled with expats and locals. If you want to catch a football (soccer) or rugby match, there’s a good chance you’ll find it playing at The Caledonia. 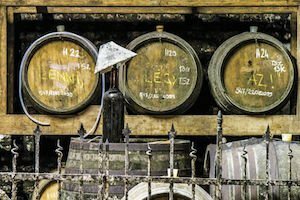 When we first moved here, we were surprised to learn that Budapest has a huge wine scene. Although Hungarian wine isn’t as famous as French or Italian wine, it’s damn good, diverse and well-priced. It’s also very popular. In fact, it’s not uncommon to see groups of young Hungarian guys drinking wine together on the weekend. As a sweeping generalization, Hungarians tend to be wine drinkers rather than beer drinkers. This is a marked departure from their neighbors in Austria and the Czech Republic. One of the more well-known wine bars in Budapest, Divino is always buzzing. Divino offers wines from all over Hungary, and prices range from cheap and cheerful to splurge. Summer evenings and weekends at the Szent Istvan location are especially busy, but the fantastic view of the Basilica makes it worth the wait. Doblo has a cozy and eclectic atmosphere in the heart of Budapest’s drinking district (the 7th). They often have live acoustic music to enjoy with your wine. 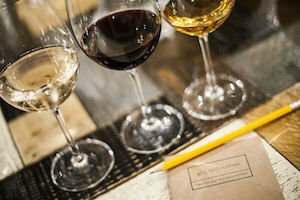 You can taste “by the glass,” or get a tasting package that will expose you to Hungary’s different wine regions. St. Andrea is the fanciest wine bar on this list, and it’s also pricer than the other options. However, it has great ambiance and nice views from the open air terrace and glass-enclosed bar. Kadarka is a cozy and colorful spot within the nightlife district. Helpful staff are willing to make suggestions, and the bar has fairly reasonable prices. A 0.7 dl glass of red ranges from 650 ft to 1590 ft (approx. €2,10 to €5,00). If you want a bit of a posh night out, the city is full of gorgeous cocktail bars to check out. Budapest has many upscale and relatively fancy bars in the city center. Many of them have lovely ambiance, and are some of the best places to drink in Budapest (as long as you’re not on a budget). A cocktail bar in the heart of the nightlife district, it’s easy to miss this place because it’s discreetly located in a cellar. Bartenders here are friendly, knowledgeable, and stylish, evoking a hipster-meets-prohibition-America aesthetic. Of course, there’s a fantastic cocktail list to choose from too, plus some beer and wine. If having a drink isn’t enough for you, Hotsy Totsy is also a barbershop. A secret speakeasy and piano bar, a trip to The Rabbit isn’t something to leave until the last minute. That’s because non-members need to get a special black card to visit Her Majesty the Rabbit for the first time. You can apply online, or hope for the best at another bar in town. We were given one at either Hotsy Totsy or DOBLO – we can’t remember exactly. They have a strict no-photo policy once you’re in. Offering more than 500 types and brands of spirits, you’re sure to find something you like at Good Spirit Bar. This bar was born out of a family-run online whiskey shop, and has an upscale-yet-relaxed feel to it. In addition to the cocktails, there’s a nice bar menu to enjoy. Located on the rooftop of the 5-star Aria Hotel, the High Note is the perfect spot to watch the sunset over Pest. The best part of High Note is the view of St. Stephen’s Basilica. It’s so close, it almost feels like you can reach out and touch the cupola! 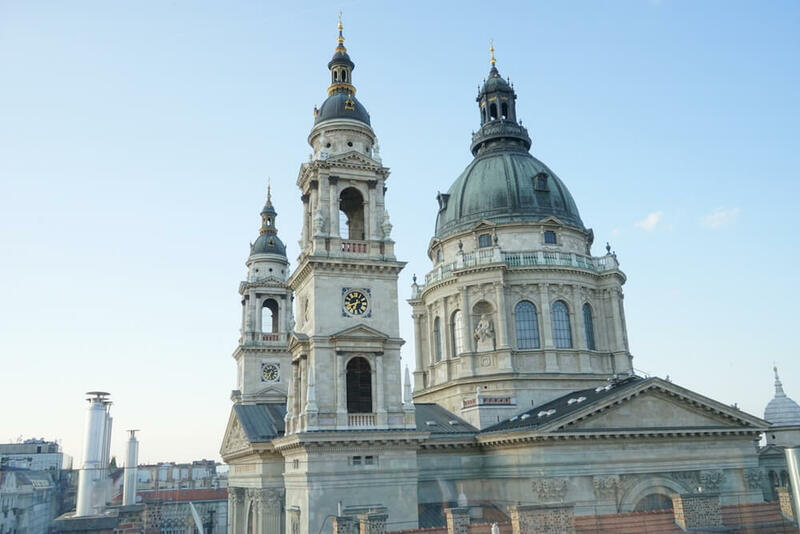 View of St. Stephen’s Basilica from the rooftop bar of the 5-star Aria Hotel, voted the best hotel in the world in 2017. 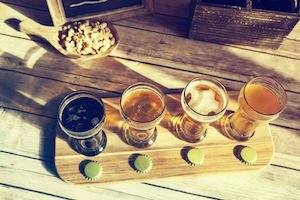 In the last couple of years, craft beer has exploded in popularity in Budapest. Because of this, it’s now possible to take your pick from an array of fantastic brew pubs, and try a range of local beer. Neked Csak is one of our personal favorites. This pub has been around for awhile, but it recently moved into a new, larger and upgraded location on Rakoczi ut. They offer more than 30 beers on tap. Because their selection is so wide, they’re able to offer both Hungarian and European craft beers. Beer Brothers is a newcomer in Budapest. Two brothers opened this pub, as you may have guessed from the name! Beer Brothers has 12 taps that rotate weekly and a menu of burgers and goulash. Although Beer Point doesn’t have a lot of ambiance, they nonetheless has a great selection of beer. Offering 16 rotating taps, as well as bottled options and pub grub-style food, it’s a solid option. I prefer going here in summer, when they open up the floor to ceiling windows, and it has a “bring the outdoors in” feel to it. Jonas is best when the weather is nice, because they have a great terrace right on the Danube! Located at the south end of the Whale Building, (Balna, in Hungarian), Jonas has 8 taps. If you need even more options, good options include First Craft Beer & BBQ, Kandallo, Lehuto, and Hopaholic. Go back to the top ?